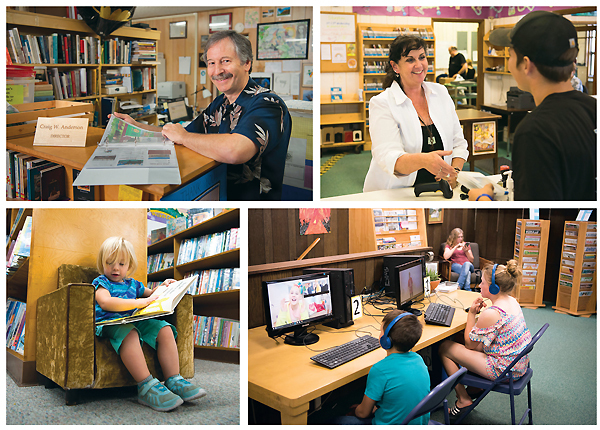 For 30 years, Sandy Ashworth, the just-retired director of Idaho’s Boundary County Library District (BCLD), developed the library’s vision and community connections and identified the county’s new needs. She saw that openings would have to be created to encourage residents to innovate and build businesses that could strengthen the shrinking farming and timber economy. Ashworth worked to get new resources and repurpose library space to develop practical educational programs at BCLD, to help upgrade and modernize skills and opportunities in the county, and to inspire confidence that this progress is coming. Bonners Ferry, BCLD’s hometown, is a small community straddling the Kootenai River; the northern county border touches Canada. The nearly 12,000 residents of Boundary County include the indigenous people of the Kootenai Tribe, seniors—some who arrived from the dustbowl in the 1930s—their offspring, and millennial ­grandchildren. When Ashworth retired last year, the BCLD board hired innovative educator Craig Anderson to run the library and continue its progress. Top photo: Boundary County Library District’s welcoming exterior. Middle row, l.-r.: BCLD’s Director Craig Anderson; Lynn Silva assists a patron with checkout, and teens take advantage of the computers in their area. Anderson, whose record includes decades teaching high school in Bonners Ferry, now works to strengthen and expand the BCLD vision and services. 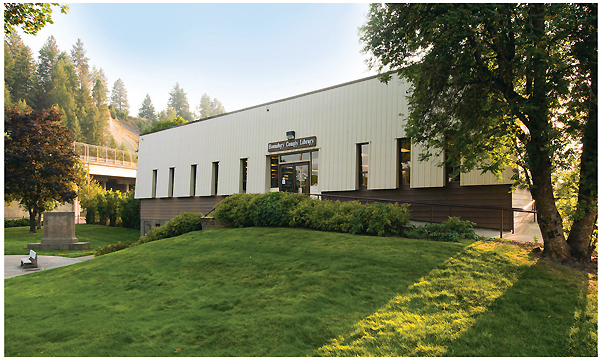 The result is a dynamic BCLD, a model for all of America’s libraries and winner of the 2017 Best Small Library in America Award, with the support of sustaining sponsor ­Junior Library Guild (a division of LJ’s parent company, Media Source, Inc.). Ashworth identified the need to raise residents’ tech skills and saw that the library could be positioned to respond. 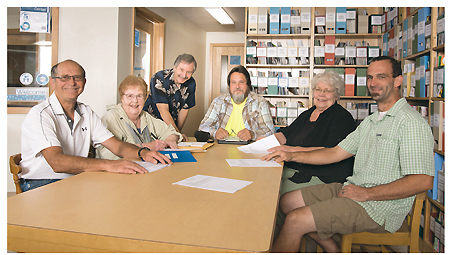 “The library’s goal is to provide people with a toolbox to allow them access to new ideas and technologies that they can use to make Bonners Ferry a more successful place,” Ashworth explains. Ashworth had read about Massachusetts Institute of Technology (MIT) professor Neil Gershenfeld, director of MIT’s Center for Bits and Atoms and his FAB program that is now global. FAB empowers local invention, engineering education, entrepreneurship, and the philosophy that anyone can make almost anything. Ashworth was so taken with the idea that she decided BCLD needed a FAB Lab, what ­Anderson calls “a Maker space on steroids.” After an attempt to get a new building didn’t work out, Ashworth reinvented the library basement; garnering $80,000 in two GEM grants and another from the USDA (U.S. Department of Agriculture) to help pay for it. “With the help of a very supportive board and budget, we went on to get the machines for the new project. It was all fit into three little rooms,” says Anderson. “The FAB Lab gets heavy use, and its machines and the 3-D printer fire up people’s imagination.... It is neat to watch someone who has never seen it before. It turns their universe on edge,” Anderson reports. Users have fabricated all sorts of models at BCLD, from a car with gears and differentials to three-dimensional log cabins to illustrate how real ones would look in all settings. For those who aren’t focused on hands-on tinkering, BCLD also uses inventive technological solutions to provide other STEM (science, technology, engineering, and mathematics) offerings beyond what most small libraries can muster. Twice a month, BCLD offers educational programs for children and adults on its wall-mounted wide-screen monitor, connected to the world through Polycom. Biologists from the Toledo and Alaska zoos demonstrate animal adaptation in real time. NASA astronauts teach about life on the International Space Station and discoveries about the sun. In concert with Bonners Ferry High School, BCLD has developed a youth entrepreneur program. Junior and senior high school technical writing students work to answer the questions: If you could have your own business, what would it be? How would you develop it? Students form partnerships and create portfolios that demonstrate most major aspects of business development and marketing. BCLD supports the project by providing community judges, procuring prize money donations, and hosting the Youth Business Fair, where the prizes are awarded. During the project’s 17 years, at least seven of the students have gone on to launch their own businesses. In fact, Under the Sun, a student-run restaurant and gift shop, was voted Most Innovative Small Business in the State of Idaho. 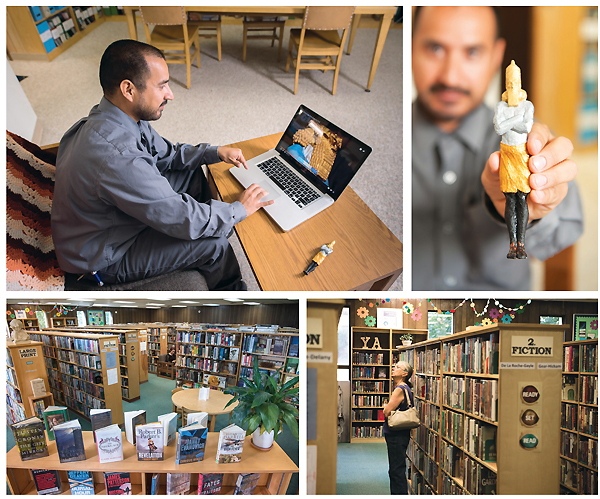 Applying that same blend of commercial and library savvy internally as well, staff used BCLD’s Lynda.com subscription to learn more about marketing and to complete a total rebranding of the library. To gain support and inspiration for its services, BCLD has joined with an impressive number of community agencies, businesses, and institutions, including local nonprofits such as the county’s 4-H, museum, hospital, homeschool association, Fraternal Order of Eagles, and the town food bank. Collaborations have been made with local schools and governmental organizations including the Bonners Ferry City Council, economic development committee, and chamber of commerce; the county school district, Head Start (of which BCLD was a founder), and the Kootenai Tribe of Idaho; and local businesses from day cares to stores and farms, as well as the Idaho Department of Labor, Idaho Department of Commerce, Idaho Fish & Game, and, of course, the Idaho Commission for Libraries (ICL). For tech support, BCLD turns to Alpha Robotics FIRST Team 2130-FAB Lab and the Fab Foundation Global Community. to create BCLD’s first painted 3-D figure, related to a research project on Nebuchadnezzar. For all its expansive redefinition of what a library can be, BCLD still hews close to its roots, tradition, and core mission. In 1913, a small group of Bonners Ferry women took wheelbarrows full of books to town to stimulate the love of learning. Like all members of the BCLD staff, Anderson was born and raised in Boundary County. Today, BCLD instills that love with winter and summer Reading Programs for all ages. In 2016–17, BCLD challenged readers to finish 4,000 books. Their final tally was more than 9,000. BCLD also works on reading and activity time with 4-H, day care, and the elderly at the local Restorium and Extended Care Facility. The BCLD Library in a Box Program provides books in English and Spanish for the local food bank, hospital, Mountain Hops Farm, and Mercantile Store to serve migrant farm workers. BCLD participates in the Read to Me early literacy program of ICL to bring story times and books to underserved county children, as well as Idaho’s “Strengthening School Partnerships” outreach initiative for summer reading. Wendy McClintock, Kenneth Blockhan Jr., Judith Mace, and Bob Blanford. Nearly half of the 11,869 people in the county have BCLD library cards. BCLD is a government bargain, providing service to all for a total annual budget of $414,237, which amounts to $34.91 per capita. Folks borrow 47,844 items per year from the library, which works with a materials budget (including electronic databases) of $62,000. People visit BCLD (open six days a week for a total of 59 hours) 73,250 times per year to use some 20 public access computers, materials, and the FAB Lab. All of this is handled by a staff of 12. 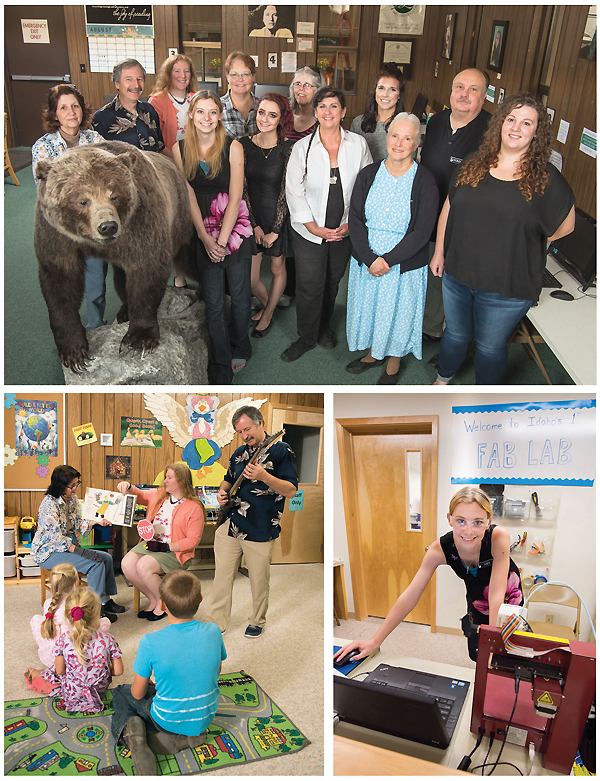 “The Boundary County Library is a model for the amazing things that can happen when a library director, staff, and board truly listen to the needs and aspirations of their community and then take action to not only meet those needs but exceed them,” says Idaho State Librarian Ann Joslin. This year’s finalists, chosen from among a large and strong array of nominees, share a focus on innovative programs and collaborations to deliver exceptional service with limited resources. Columbus Public Library’s staff, under the leadership of Director Cindy Fesemyer, took its Harwood Institute Turning Outward training to heart. 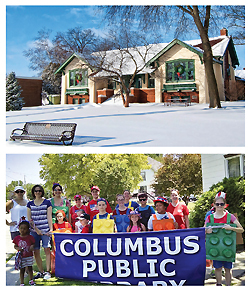 A series of community conversations with its 15,000-person service area led the library to create after-school and teen clubs, plus the Root for Columbus civic engagement program for adults, spun out of a Libraries Transforming Communities grant and propelling what one nominator called a “renaissance” for the library. The program uses potluck brainstorming sessions followed by small group work to create two to four small yet visible projects to help residents improve their community, from a garden walk to public art. A more ambitious challenge is to help revive Columbus’s flagging downtown by partnering with the local chamber of commerce and retailers to add library programming and displays to existing communitywide events to broaden their appeal. The library also convened and facilitated meetings for business owners to support one another through a main street reconstruction and developed information outlets to connect businesses to customers. Fesemyer, part of the Public Library Association Leadership Academy cohort, is using those resources to help the mayor and city administrator realize a need for city planning, link them to planners, and further community conversations on the topic. Rosemary Cooper, an award judge and director of the 2016 Best Small Library in America, sees “something infectiously organic” about the Columbus library’s approach to community engagement. You’ve heard the saying 24-7. 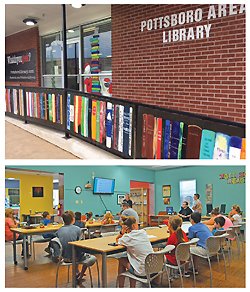 Pottsboro Area Library is open 23-6—but in this case, that means a total of 23 open hours spread over six days a week. Yet despite its limited schedule and still more limited budget—the library manages on just over $8 for each of the 3,415 people in its service area—this little library is doing big business. Pottsboro’s volunteer director, Dianne Connery, came to the job via joining the library board in 2010. Since then, the library’s usage has nearly doubled—and its financial support from the community has increased nearly 500 percent, in addition to being supplemented with creative fundraising and a lot of volunteer labor, including a partnership with nearby Austin College for student help with marketing and grant-writing. Pottsboro participates in national initiatives, including Harwood Institute training for its two staff members and volunteers, as well as Project Outcome and Edge initiative assessments. The latter drove the addition of Sunday hours, Wi-Fi that reaches beyond the building, and an investment in assistive technology. LJ’s annual award, relaunched this year with the support of sustaining sponsor ­Junior Library Guild (JLG, a division of LJ’s parent company, Media Source, Inc.), was originally created in 2005 to encourage and showcase the exemplary work of libraries serving populations under 25,000. The winning library will receive a cash prize of $5,000 from JLG; two honorable mention libraries will receive $1,000 each in credit toward purchasing Junior Library Guild book selections for their collections. JUDITH L. GOLDSTEIN: Senior Vice President of Marketing, Media Source, Inc.